Former teachers of Olympic gold winning rower Helen Glover have described her as a "phenomenal all-round talent". Although she now lives in Caversham, near Reading, Miss Glover, 26, started her sporting rise to fame as a child in Newlyn, west Cornwall. She went to school at Humphry Davy in Penzance, where she is fondly remembered as a girl who always involved herself in all sports. A huge screen and bunting filled the hockey club in Penzance where many witnessed Helen Glover and her partner Heather Stanning achieve Team GB's first gold medal. 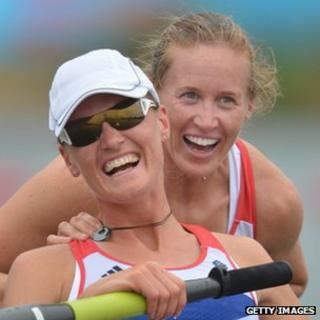 Glover and Stanning also made history by becoming Britain's first ever female rowing gold medallists. Miss Glover's uncle, Rob Evison, said: "The family is very emotional, very proud. They were incredible. Beautifully smooth. We're over the moon." Her mother, Rachel, said the family was still trying to get to grips with the sport after Helen started rowing just four years ago, but added they were "absolutely delighted" at her "meteoric, rapid rise". Watching the race at the Penzance Hockey Club, local resident Barry Wright said: "It was incredible, my heart is still pounding. I can't describe what the feeling's like. Only Helen could do it." Miss Glover's former PE teacher, Kate Finch, said: "She always had this phenomenal all-round talent, totally committed and totally reliable. "You knew if you had Helen in any team you were safe. She took part in everything. She excelled in hockey and cross country. "Helen was so hard working and so coachable. If you asked her to do something, she would do it." Andy Thomas, a former deputy head at the school, said: "I'm just amazed that someone from a small school in Penzance can make it to the top of her game." Despite her heavy training schedule, Miss Glover has kept in regular contact with the school that first witnessed her sporting skills. Mr Thomas said: "She's been very involved in the school for the last year really, in the run-up to the Olympics. "She's been to the school and sent video messages to the pupils. It's amazing to see her level of commitment tied in with the level of training she must have to do." Ms Finch added: "I have been very impressed with how she's coped with the pressure. "Goodness knows the hopes of the nation have been on her shoulders." Team GB posted on Twitter "Proud does not cover it!!" while the pair were being presented with their medals. Speaking after her win, Miss Glover, who appeared to be smiling in the last quarter of the race, said it was "probably a grimace". She said: "I don't remember smiling because I remember never, ever, ever thinking we've got this." The medallist added that she hoped the performance would inspire others. She said: "If you work hard and try your best absolutely anyone can do anything." To mark their win, Royal Mail announced the rowing pair were to appear on a stamp that would be available within 24 hours.